What will be the approximate latitude shown on the display unit of an inertial navigation system at longitude 025°W? Let’s start with a really quick primer for anyone not already up to speed with General Navigation. Because the Earth is roughly spherical (geeky fact – it’s an Oblate Spheroid), the shortest distance between two points on its surface isn’t a straight line. If you were to stretch a piece of string between two points on a ball, you’d end up with the string describing part of a circle who’s centre would match the centre of the ball itself. This is called a Great Circle, and this is the same route an aircraft takes between two points on the Earth. 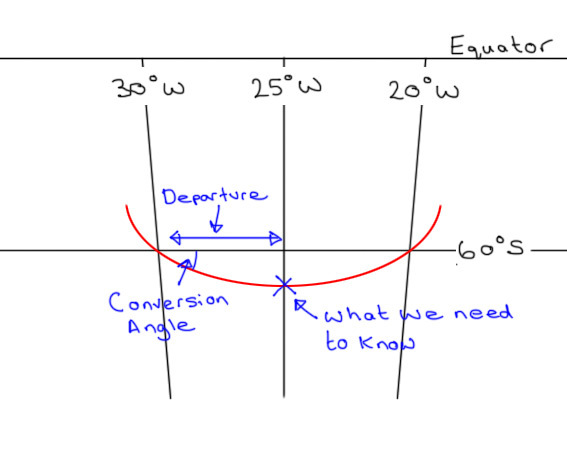 Maths for the ATPL course is simplified to a practical level – there’s no spherical Trigonometry, but the syllabus still teaches the key concepts in long range navigation. 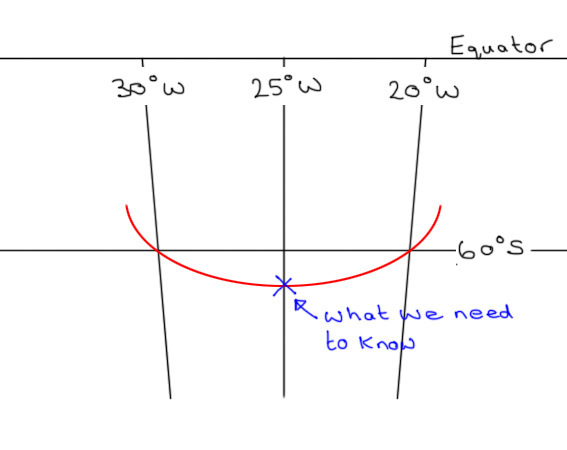 If we can find the Conversion Angle and the Departure shown on the diagram above, we can use basic Trigonometry to find out how far South of 60° the point on the Great Circle track actually is. Let’s start with the Conversion Angle, which is the difference between the Great Circle Track and the associated Rhumb Line. I don’t want to complicate things too much, but a Rhumb line between two points crosses every Meridian at the same angle. Therefore, a Parallel of Latitude is a Rhumb Line. 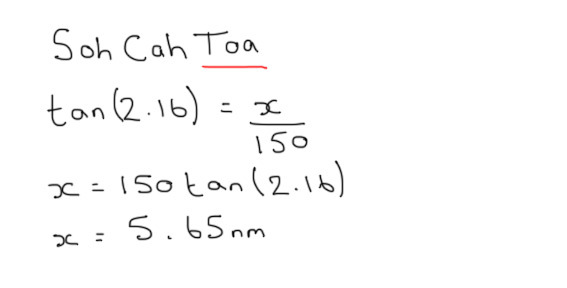 In the case of our question, the change of Longitude, or chLong is from 030°W to 025°W, or five degrees. Both points under consideration are at 60°S, so the mean Latitude is 60. 60°05.65’S, or 60°06’S to the nearest minute. I think this is a pretty good question, as it tests lots of different parts of the GNav syllabus, and ensures you can put all of the different parts together. It’s fairly long winded though, so I hope it’s worth a few marks!